Attacker who scored three times for Ecuador at the World Cup makes the switch from Mexican side Pachuca. 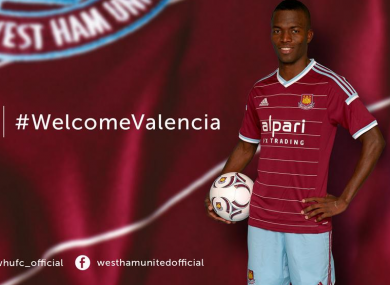 ECUADOR’S ENNER VALENCIA has completed his move to West Ham United after he was granted a work permit. Valencia, 24, agreed to join the Hammers from Mexican side Pachuca on a five-year contract earlier this month after being his country’s standout performer at the World Cup. Reports have suggested the transfer fee came close to the club record sum of £15million paid for striker Andy Carroll last summer. Formerly of Ecuadorean side Emelec, Valencia only joined Pachuca in January this year but his excellent performances at the World Cup generated widespread interest from clubs in Europe. Valencia scored all three of Ecuador’s goals in Brazil, including a brace in a 2-1 victory against Honduras, but he could not prevent the South American nation from being eliminated in the group stage. Valencia is West Ham’s fifth summer signing following the captures of Argentine forward Mauro Zarate, Senegal defender Cheikhou Kouyate, left-back Aaron Cresswell and youngster Diego Poyet. Email “West Ham finalise a deal for striker Enner Valencia ”. Feedback on “West Ham finalise a deal for striker Enner Valencia ”.